The Continental Divide, also referred to as North America’s backbone, cuts through Wyoming from the northwest to the south central border. Rivers east of the Continental Divide drain into the Missouri River Basin and eventually the Atlantic Ocean. Rivers west of the Continental Divide drain into the Columbia or Colorado River Basins and then into the Pacific Ocean. Togwotee Pass (pronounced toga-tee) is a mountain pass located on the Continental Divide in the Absaroka Mountains of the United States, between the towns of Dubois and Moran Junction, Wyoming. The pass provides the most direct access to Grand Teton National Park from eastern Wyoming. Sweeping vistas of the Teton Range are visible from the western slopes of the pass. Togwotee Pass receives heavy winter snowfall, and is North America's premier destination for snowmobiling. 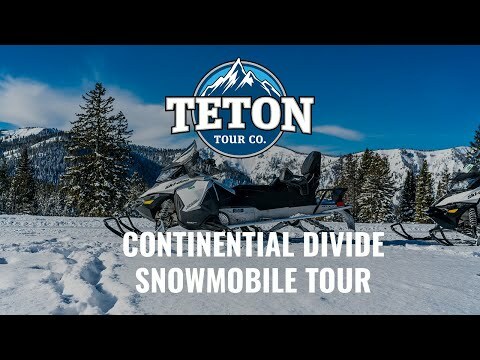 Call 307.733.8800 to book your Continental Divide Snowmobile Tour today! We offer 2.5 million acres of backcountry off-trail riding and 608 miles of well-groomed trail riding. Our scenery is spectacular and can’t be beat. Our snow is typically fresh and powdery. We have diverse terrain for advance snowmobiling. Our winter season starts earlier and lasts a bit longer, making it perfect for all kinds of riders. Call 866.278.4245 to book your Continental Divide Snowmobile Tour today! Find out why the Continental Divide Snowmobile Trail (CDST) is currently the #1 destination for snowmobiling in the West and has consistently been in the top two the last 10 years! With over 600 miles of groomed trails and 2.5 million acres of powder, there is something here for everyone! Whether you’re a thrill seeking “powder hound” or have never even looked at a snowmobile before, we can keep you busy for days. Make the most of your riding days, hang out with other snowmobilers in the evening, and see more powder than you could ride in a month. Experience all that this majestic country has to offer on the Continental Divide Overnight Snowmobile Trip. Please call us to design an overnight trip that will be exactly what you are hoping for! Drivers for all snowmobiles must be at least 16 years of age or older. Passengers must be at least 5 years of age or older. Children must be accompanied by an adult of guardian. For small groups (8 snowmobiles or less) there is a 7-day cancellation policy. For larger groups of 9 or more snowmobiles, there is a 30-day cancellation policy. Inside the 7-day (or 30 days), the entire cost of the tour is non-refundable. NOTE: We do NOT make exceptions so please consider trip insurance in case of emergencies or last minute changes. $35 buys you a $1150 deductible for powder snowmobiles.